Dozens of fish were killed when up to six miles (10km) of river in a country park became polluted, the Environment Agency said. 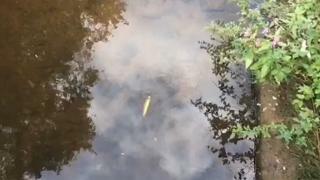 Brown trout and other fish died in the River Lostock at Cuerden Valley Park between Chorley and Bamber Bridge, Lancashire. The agency said it had identified the source of the contamination and was "progressing with legal action". People are being advised to keep dogs and children out of the water.